Please support your Club's premier running event. If you are not racing, volunteers are still much needed! Reston Runners is hosting our seventh annual Runners Marathon of Reston on Sunday, April 7th. Each year we need over 200 volunteers race weekend to put on this race, and your help is critical! All volunteers receive the same bling as runners, including a hoodie sweatshirt, a hoorag (neck warmer), gloves, and free prerace dinner. Our area of greatest need is along the course where you will cheer and direct runners. Your teenager can receive volunteer hours for all time spent helping out. We sign forms online and in person! If you are running the race, you can still sign up to help serve dinner, assist with packet pick up the day before or (EXTRA POINTS) help us tidy up the school after you finish your race. Celebrating another Club year in review with the Treasurer's report and congratulations to this year's Board of Directors. Minutes from the February 17, 2019 Board Meeting are available HERE. Special thanks to Laura Stassi for organizing a festive dinner and to Luz Blakney for a great year-in-review slide show. Awarded annually by the Board to a member in recognition of sustained, continuing service to the Club. It is named in honor of the first recipient, Club founder Joe Fleig. Congratulations to David Breese, this year's honoree. Please RSVP as the Club will provide the food and beverages so we need an accurate headcount. Minutes of the January 12, 2019 meeting are available HERE. Finish Line Services end of season race timing at the "Fill the Shoes" 5K in Springfield, VA. VIEW a picture set. November 10, 2010 - Small, but enthusiastic gathering for a brisk Saturday morning run or walk from South Lakes Village Center in Reston. Kudos to our friends for their great race times in Richmond this morning! Busy weekend with the return of the Pacific Twist shaved ice truck at the Saturday run and traditional races on Sunday including the Annapolis 10 Miler and the Leesburg 5K/20K (pictured here). Thanks to all volunteers and attendees for another great Summer event! Click on the image to enlarge and to see other pictures. Runner's Marathon of Reston & Cherry Blossom April 6th pre-race Kick Off at Potomac River Running. The minutes from the September 15, 2018 Board Meeting are available HERE. Please contact a Board member with any questions. The Board will be posting meeting minutes and Club financial statements. View the minutes from the May 5, 2018 meeting. Not too soon to get your Halloween costumes ready as the next Volunteer Apprecation Breakfast will be held on October 27, 2018 at the North Point Center Glory Days Grill following the run/walk. There will be prizes for the best costumes! Please join in this Saturday for a potluck breakfast hosted by Marcy. Details at the run/walk. A Reston Runner annual tradition. Point to point run from DCA National Airport back to Reston. Distances up to 22 miles with shorter options via Metro (bring your Metro card). Please sign up so we can plan the transport to the airport. The bus will leave the Sunset Hills Commuter lot in Reston at 7 am. Reston Runners’ Youth In Motion (YIM) program is a non-profit, non-competitive summer youth running/fitness program. The program has been recognized in the past as the best youth running program in the country by the RRCA (Road Runners Club of America). It is open to youth ages 4-13 years. The program will take place at Herndon Middle School Track and Infield. It will run from June 24 to August 12 (Sundays 6:30 pm – 7:40 pm). The final session on August 19th will be a morning race and party at Lake Fairfax Park. As always we need enthusiastic volunteers! Thank you to our volunteer coaches who again this year make thiis great youth fitness program poissible! Click on the picture for photos. Pool Party - August 4,2018 Please plan on joining fellow Reston Runners and families for this festive Summer event, 7 pm at the Autumnwood Pool. The Club will be providing the food and beverages so please RSVP to ensure we have enough. The Reston Runner's 10 Weeks to 10K Program returns this year starting Monday, July 23,2018 and culminates with the PRR Perfect 10K/10 Miler on Sunday, September 30, 2018. Congratulations to all participants and thanks to all volunteers! Race Results. Time to boost your speed as ITP is back starting on Wednesday, June 20, 2018 at 6:30 PM at South Lakes High School, and continuing weekly until Auguist 29th. Registration is still Closed. 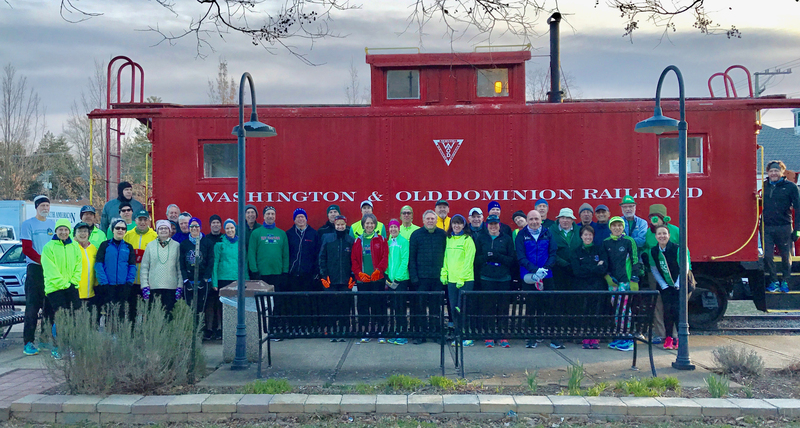 Runner's Marathon of Reston - April 7, 2018 . Congratulations Runners & Thank You Volunteers! Keith Whited again makes a generous donation to Reston Runners Community Fund and to the Club's Runners Marathon of Reston with these checks presented at the Glory Days Volunteer Appreciation breakfast. In lasting memory of Reston Runners who have passed away. Click on the picture for photo set. 10 Weeks to 10K - 2017 - Congratulations to all participants & thanks Chris D ! Sky Meadows State Park ( http://www.dcr.virginia.gov/state-parks/sky-meadows#general_information ) Please sign up to let us know how many to expect. Meet at South Reston Commuter Lot at 7am for car pool oiption. Congratulations to all our intrepid runners who braved the cold and rain to run this iconic race. click HERE to see a race report by Marcy Foster. Full results are availabke HERE. Congratulations to all New York City Marathon runners and their supporters! Click HERE for finish times. Reston Runners continues its two decades of celebrating and supporting women athletes by again offering its Women's Training Program with registration opening on March 9, 2018; and its Women's 5K on June 23, 2018. Registration for the 5K opens on March 23, 2018. All Reston Runners are cordially invited to attend the annual meeting and dinner from 6 to 9 p.m. on Saturday, Feb. 24, at the Reston Community Center, Hunters Woods Village Center, 2310 Colts Neck Road, Reston. Drinks and dinner available when the doors open at 6 p.m. The program begins at approximately 7:15 p.m. Please RSVP to give us an accurate count for planning. Please indicate there if you're available to volunteer your time in one of the following three areas: Room setup/member check-in; drinks setup/serving; food setup/replenishing. Reston Runners is holding its annual election to determine who will serve as the Reston Runners Board of Directors for 2018. Each year all Board of Director positions are open for election. The positions include President, Vice-President, Treasurer, Secretary, Director of Walking Program, Members-At-Large and Under-40 Member-At-Large. All members paid up through 2017 or later are eligible to vote. The ballot is being prepared with the names of candidates who have accepted nominations. Eligible members will receive an online voting ballot by email. A paper ballot will be provided as an alternate means of voting, on request. Elections will be open until February 17, 2018, so please be sure to complete the online ballot or paper ballot by that date. Candidate winners will be announced at the Reston Runners Annual Meeting on February 24, 2018. A researcher at the National Institue of Mental Health (NIMH) in Bethesda has written to us seeking healthy adults for a study. For information, click HERE. Thanks to all program leads, volunteers, and participants! Congratulations to all participants and thank you volunteers! Some members of the 2017 Reston Runners Board of Directors . Please click on the picture to see full photo set by Brian Kent.